Since the shooting of the Trailer of MGS: Philanthropy – Part 2 will be in a remote location in Italy, this drafting is in Italian only. Nonetheless, follow us since we’ll share pictures of the location and backstage! Since our chat with Hideo Kojima, in Hive Division we’ve been talking about finally resuming the Philanthropy project. Snake, Elizabeth, and Pierre were on a journey we were forced to interrupt, and those black clouds above the mountains of Daskasan have been staring at us ever since, asking “Will there be an end?” through Aoife’s ethereal voice. And even if we were – and we still are – genuinely scared of the amount of work that will be required to bring that journey to its end, after a quick check with all key members of the original MGSP team, we decided to give it a try, so… There will be an end and there will be sequels to MGS: Philanthropy. Right now we’re rummaging through the original story we wrote some 7 years ago. We are not sure yet about all the details of the operation, we just know it’s probably going to be a web series and that we’ll need to throw a crowd funding campaign in order to make it feasible. We’re also likely to emphasize backstage and production reports compared to the past – we used to be a somewhat faceless entity that only surfaced when a release was imminent. We’re in 2013 and that will have to change, so any suggestion about how MGSP fans would like to be updated about the project or how they would like to interact with our team will be deeply appreciated! Thanks everybody for the love you gave MGSP during these years – see you in Daskasan. It’s hard to explain how good it feels to see our work appreciated not only by the fans, who support us with their appreciation and enthusiasm, but also by the person who so greatly inspired us to become creatives and filmmakers. MGS: Philanthropy laid low for too long. 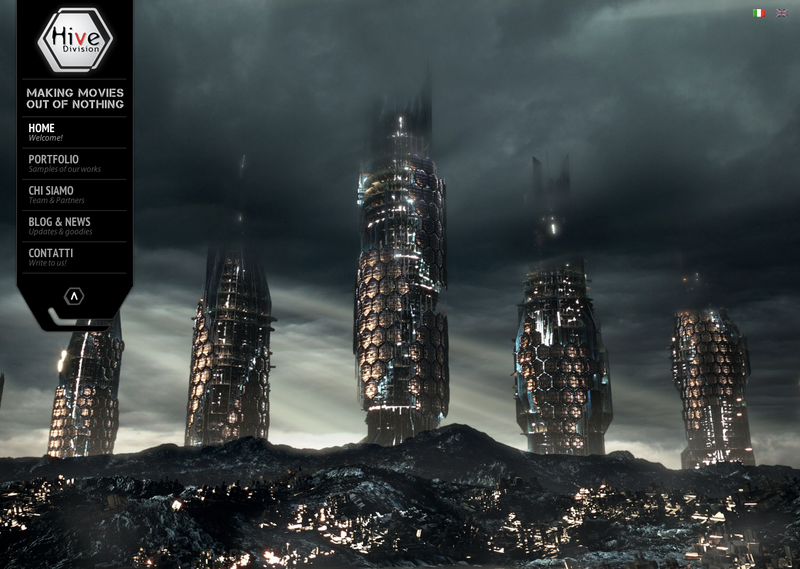 It’s time for Hive Division to decide whether it will die or will rise from its ashes. A quick update to announce the brand new (epic) website of Hive Division and our Newsletter service! Visit the website if you want updates & news on upcoming Hive Division projects. Subscribe to the Newsletter if you want to receive the latest communication about what’s going on in Hive Division! And thanks for staying with us! In the last (not so recent) update we talked you about the new, original projects Hive Division was working on. It took us some time and effort, but the first of those project is ready for its debut. 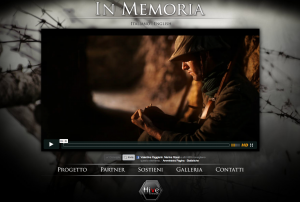 So here we are, introducing “In Memoria”, our World War I film project. We hope you’ll enjoy it (and chances are you’ll recognize a lot of MGS: Philanthropy “assets” in the trailer ^__^)! This is the first anniversary since the online release of MGS: Philanthropy on September 27th, 2009. During this year, many things have happened. First of all, we would like to thank you all for the warm reception of our movie, for the interviews, for the hundreds of e-mails you sent us. It is amazing to see the impact that the movie had on the Net, and not only… It’s thanks to people like you, who have downloaded, shared, watched and talked about our movie, that we could reach a lot of faraway places in the world with our production! We also want to thank all the team that worked on the project: everyone contributed to make the MGSP adventure a gorgeous journey together! We already have the scripts ready for MGS: Philanthropy Part 2 and 3, and we are working on a “long-term” plan to turn them into reality but… not right now! After so many years of non-profit works, we really need some time to concentrate on becoming a real production studio, turning our passion into our profession. So, while the “long-term” plan on completing MGS: Philanthropy becomes true, we are focusing our attention on several original projects by Hive Division. The good news is that the Hive Division team is still unite and kicking (and growing, too) and willing to go on with independent productions! Right now, we are working on THREE original projects, all produced by Hive Division: one of this projects will be shortly announced on our official website! I cannot disclose anything more than this, but I assure you that we will keep you updated on our official website (http://www.HiveDivision.net). So, if you loved MGS: Philanthropy and you are interested in the next productions by Hive Division… You know where to find us! Happy birthday MGS: Philanthropy, and thanks again to you all for following us in this amazing adventure! 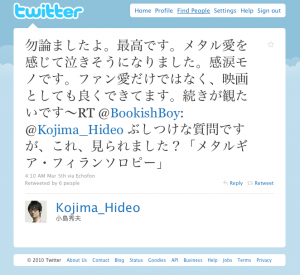 Ok, we could not believe it, but we found a comment on Twitter by Hideo Kojima, about MGS: Philanthropy. 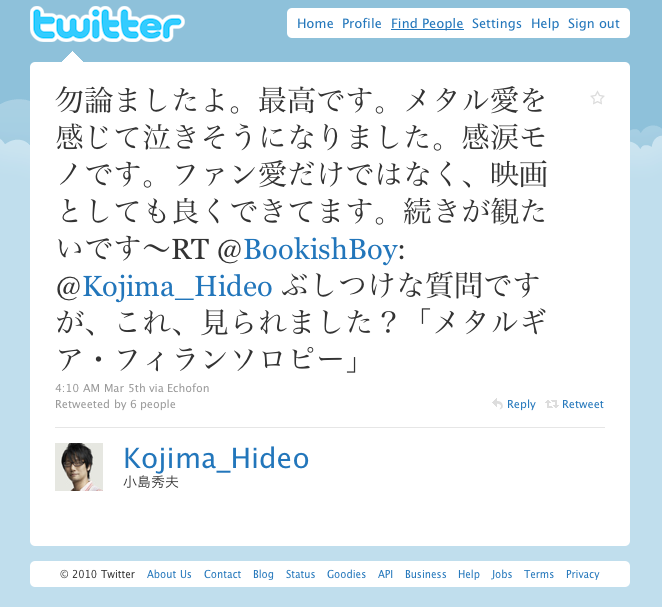 A fan asked him if he had watched the movie, and his reply is really… Well, you can read it here (on official Hideo Kojima’s Twitter). Here’s a screenshot of the message and its translation (thanks to Ash Volf for translating this into English). RT @BookishBoy: @Kojima_Hideo I know this must be asking too much, but did you see “MGS Philanthropy”? Of course I did. It’s awesome. I felt like crying for their love towards Metal Gear. It’s also a well made movie. I can’t wait to see next part. What’s going to happen next? We still don’t know, but since we too would like very, very much to see (and produce!) the next parts of the movie… We’ll try to contact Mr. Kojima and find out ourselves! Thanks to Lucas “halosolid” Gabriel for discovering the message! March is a month full of events! The technology company M31, based in Padova, is organizing an event at Centro Altinate: on March 27th, 2010, from 6 to 8 pm, there will be a screening of MGS: Philanthropy, a short speech of several members of Hive Division (Giacomo Talamini, Alessandro Schiassi, Alberto Vazzola, Lamberto Azzariti) and a Q&A session. Also some lead actors from the movie will attend the event (Patrizia Liccardi and Marco Saran). We warmly thank M31 for the organization and the support! The event is free and to attend you have to register here (limited seats available). Here you can find the official press release of the event (Italian only). For further information, please have a look at the Facebook page of the event or write us! On March 25th, 2010, at 9 pm, MGS: Philanthropy will be screened at Palazzo Granaio, during a movie night. Giacomo Talamini (Director) and Alessandro Schiassi (VFX Supervisor) will attend the event and will answer all your questions during the Q&A session after the movie. The entrance is free and everyone is welcome! Metal Gear Solid: Philanthropy has its own page on IMDB! You can find there a lot of information about the cast, the crew, and all those who gave a hand. Please, have a look at the page, and – if you want – rate the movie!